Two days to go, and it’s a tossup. 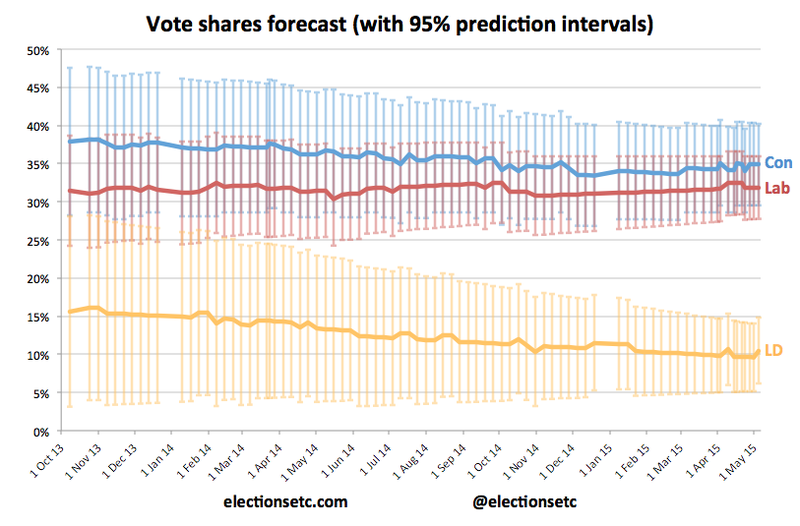 Our model now gives David Cameron and Ed Miliband each a 50% chance of being Prime Minister after the election. Neither has much hope of a majority: we give the Tories a 9% chance of winning 323+ seats, and Labour less than a 0.1% chance. That means a 91% chance of another hung parliament. 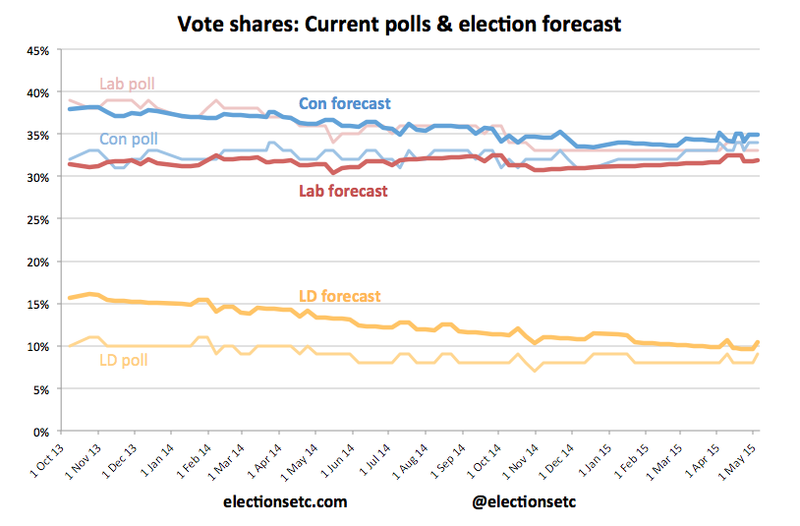 The main movement in our polling average since Friday is a 1-point gain for the Liberal Democrats, to 9%. The Tories retain a 1-point lead over Labour, 34% to 33%, while UKIP are still on 13%. 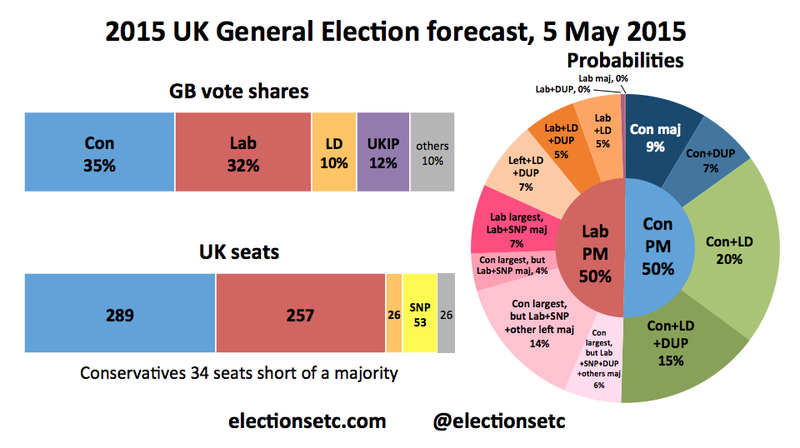 Our central forecast has the Tories and Lib Dems each doing about 1 point better than the current polling average, and Labour and UKIP each doing about 1 point worse. In that scenario, the Tories win 35% of the vote and 289 seats, 34 seats short of a majority but ahead of Labour on 32% and 257. The Lib Dems get 26 seats with 10% of the vote and UKIP get 3 with 12%. Meanwhile, the SNP win all bar 6 of Scotland’s 59 seats. That central forecast would mean the Conservatives could just form a majority with the Lib Dems and the DUP (for a total of 324 seats). Because of their willingness to work with either Labour or the Conservatives, we give the Liberal Democrats a 53% chance of being part of the majority grouping – slightly higher than either of the two larger parties – even if we assume they won’t join one involving the SNP. Previous PostLinks between economics and nationalism at this electionNext PostCoalition-directed voting comes to Britain? I am troubled by your definitions – GB includes Scotland but the SNP is not shown as getting a % of the GB votes? Are you saying it does not? Because this election is (a) very much a matter of very fine voting margins & (b) almost definitely will give a hung Parliament, it behoves you to get into the small party detail. Include the DUP, Greens etc etc. Shae on you for not – dumb!